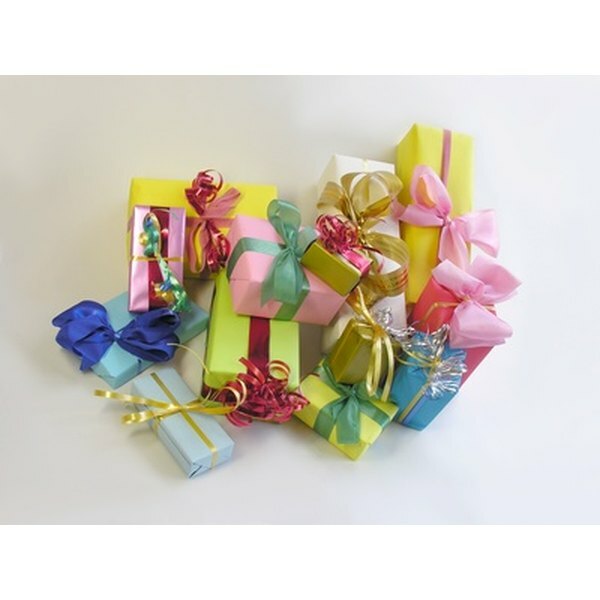 Gift catalogs often offer a gift wrap option. Catalog shopping allows you to find the ideal gift for just about anyone on your list. Gift catalogs put an array of items right at your fingertips. Plus, many catalogs offer financing options, payment plans and gift wrapping. Catalog shopping is ideal for individuals who cannot get out to shop or simply do not have the time. The Harriet Carter gift catalog has been around since 1958. From home goods to toys, the catalog features an array of helpful and unique items that can be purchased as gifts. It also has many "As Seen On TV" products for sale. Orders from the Harriet Carter Catalog can be placed by phone, fax or on-line 24 hours a day, seven days a weeks. For more than 10 years, the Lakeside Collection has offered its customers high-quality merchandise at rock bottom prices. With everything from clothing and toys to "As Seen On TV" and licensed sports merchandise, the catalog truly has something for everyone. Orders can be placed 24 hours a day, seven days a week by phone, fax or on-line. However, prices are extremely low in the Lakeside Collection catalog, so place order promptly to avoid backorders and cancellations. The Lillian Vernon catalog is known for its unique selection of personalized gifts. The catalog has a huge selection of non-personalized gifts as well. However, personalization from Lillian Vernon gifts is free. Lillian Vernon has been around for 56 years, and has three catalogs: Lillian Vernon, Lilly's Kids and The Big Sale Catalog. Catalog orders can be placed anytime over the phone or on-line. The Miles Kimball catalog has been around for more than 75 years. The speciality of this catalog is in personalized items such as designed labels, calendars and photo products. However, the catalog also carries an array of gift items from toys to household goods. They also carry many "As Seen On TV" items. The catalog has several options for ordering including phone, mail and on-line. Hammacher Schlemmer printed its first catalog in 1881. The original hard cover catalog sold hardware. Hammacher Schlemmer eventually became known for selling unique and innovative products. The catalog has extravagant items with price tags in the thousands, alongside items that are practical and affordable, costing less than $20. Orders can be placed on-line, over the phone, by fax or mail.